Chicory is thought to have been cultivated as a food plant since about 300 BC. Now commonly grown for use in salads, use of the root as a beverage became important alongside other coffee substitutes in the late eighteenth century. A stiffly erect ± robust perennial herb up to c. 120 cm. tall, from a long stout taproot. Stems annual, usually divaricately branched above, striate, densely hispid-setose to glabrescent. Basal leaves 7–30 x 1–12 cm., oblanceolate in outline, runcinate-pinnatifid, obtuse-acute at the apex, semi-amplexicaul below, dentate to remotely denticulate on the margins, hispid or pilose to glabrescent; cauline leaves smaller, mostly oblong-lanceolate and undivided, sessile and amplexicaul, dentate to entire, hispid or glabrescent. Capitula 2.5–3 cm. in diam. 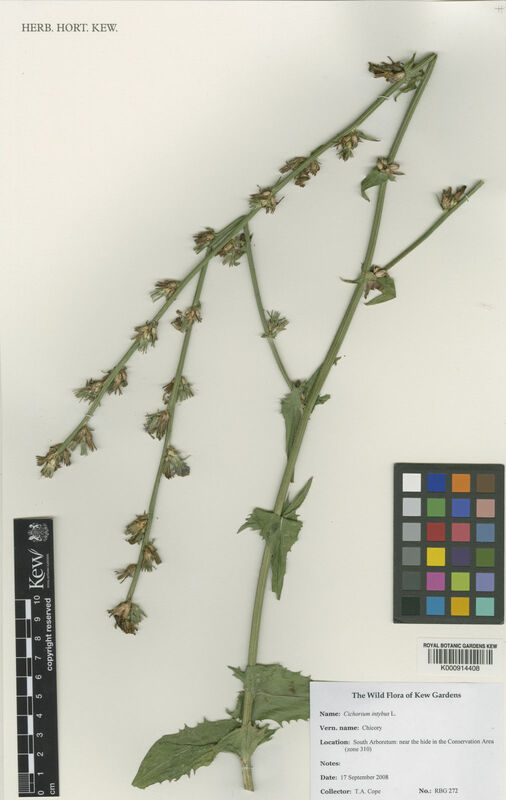 measured across the expanded ligules, 2–4 sessile in axillary clusters on the usually very long ± flexuous patent-ascending branches, the clusters subtended by large foliaceous bracts, or capitula solitary and terminal on apically thickened stalks up to c. 9(14) cm. long. Involucres to c. 11(14) mm. long, cylindric. Phyllaries 2-seriate, coriaceous, glandular-ciliate on the margins and midrib, or glabrous; outer phyllaries up to 8 mm. long, narrowly ovate, patelliform-thickened below, apices acute becoming recurved; inner phyllaries up to 11(14) mm. long, lanceolate, erect, apically pubescent Corollas c. 18 mm. long; the lower portion c. 2 mm. long, cylindric, pubescent or pilose-hairy above; ligule c. 16 mm. long, widening to c. 4 mm. at about the middle, lorate, right blue rarely pink or white, pubescent or glabrous outside, densely pubescent on the apical lobes, ligules spreading. Achenes c. 2.5 mm. long, obconic, truncate above, somewhat 5-angled, rugose-scabridulous; pappus several-seriate of numerous persistent short scales up to c. one quarter of the length of the achene. Recorded in the Flora Zambesiaca area as a cultivated herb and also as a garden escape, occurring on roadsides and in disturbed areas. 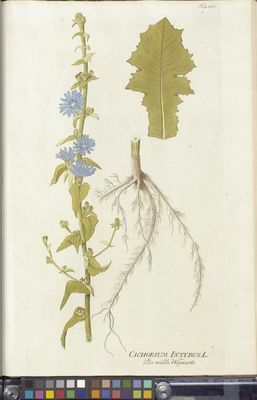 Cichorium intybus is one of six species of Cichorium and should be distinguished in particular from C. endivia, which was cultivated by Ancient Greeks and Romans for its leaves. Cichorium endivia can be distinguished by its long pappus scales, hairless leaves, annual life span and self-compatibility. In France, chicory is commonly referred to as 'endive,' which now causes some confusion between the two species. A number of cultivars of Cichorium intybus are available. Some are grown for their roots, which are used for coffee flavouring. Others are selected for their leaves, which are used in salads. These can either be grown during the summer months or be 'forced' in darkness to produce blanched tips (chicons) from January to March. 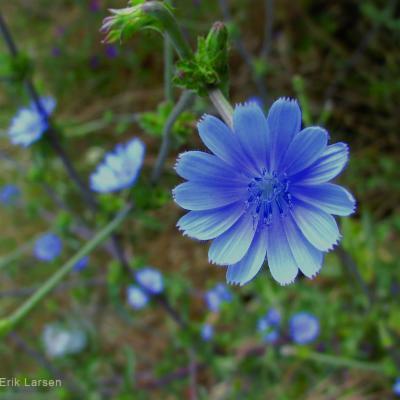 Chicory has an attractive blue flower head and is grown as an ornamental, but it seeds freely and is considered invasive in North America and Australia. 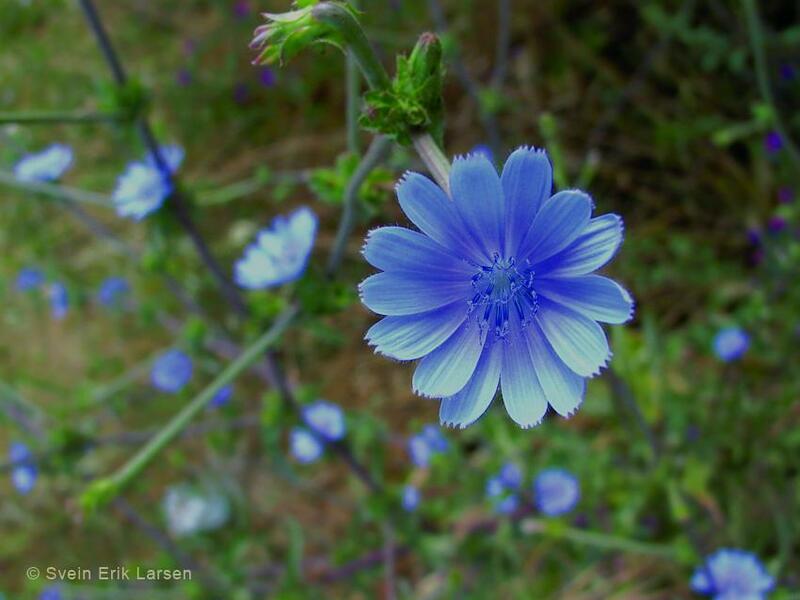 Cichorium intybus is native to Europe, northernmost Africa and West and Central Asia. It has been introduced elsewhere in temperate and semi-arid regions and is widely naturalised throughout North America. It is seen most commonly on roadsides, waste ground and other recently disturbed sites. It does not typically colonise undisturbed natural areas. Overview: A clump-forming herbaceous perennial growing up to a metre tall, with a long tap root. Leaves: Toothed, with short hairs. Leaves forming a rosette at the base, with smaller leaves arising from the stems. Flowers: The inflorescence (flower-bearing structure) is branched and is composed of many dozen flower heads (capitula). The florets (single flowers) are hermaphrodite and possess corollas with long strap-shaped limbs with five apical teeth. The flower heads are normally clear blue, but occasionally the corolla is white or pink. Each flower head only blooms for a day. Fruits: The fruits (achenes) are mottled brown and generally dispersed by animals and human activity rather than by the wind. As well as reproducing by seed, the plant can grow from pieces of its root, making it difficult to eradicate if it grows as a weed. Chicory is predominantly used as a food crop. There are several different types, and broad-leaved forms are used in salads or cooked as a vegetable. Cultivars from the witloof group are used to produce chicons, which are the blanched (whitened) leafy growths produced by forcing the first year roots to produce early leaves indoors in the dark, at a temperature of about 18oC. These cultivars originate from Belgium; the first witloof chicory entered the market in Brussels in 1846. The taste of chicory leaves produced in sunlight can be bitter, and forcing in this way reduces the bitterness. Some cultivars are less bitter and can therefore be grown directly for use in salads. Members of the following cultivar groups are grown in this way: pain de sucre group and raddicchio group. Chicory root can be chopped, roasted and ground and the resulting powder added to ground coffee. A liquid extract may be produced from the root and added to liquid coffee extract. Cultivars from the root chicory group are grown for their roots. 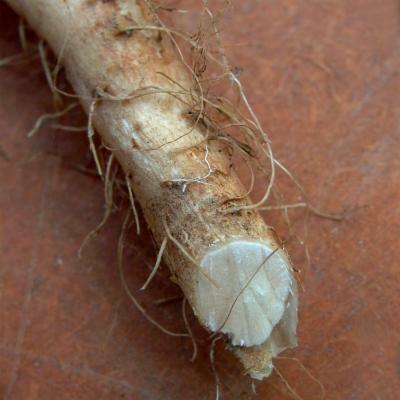 Chicory roots are produced in various European countries. 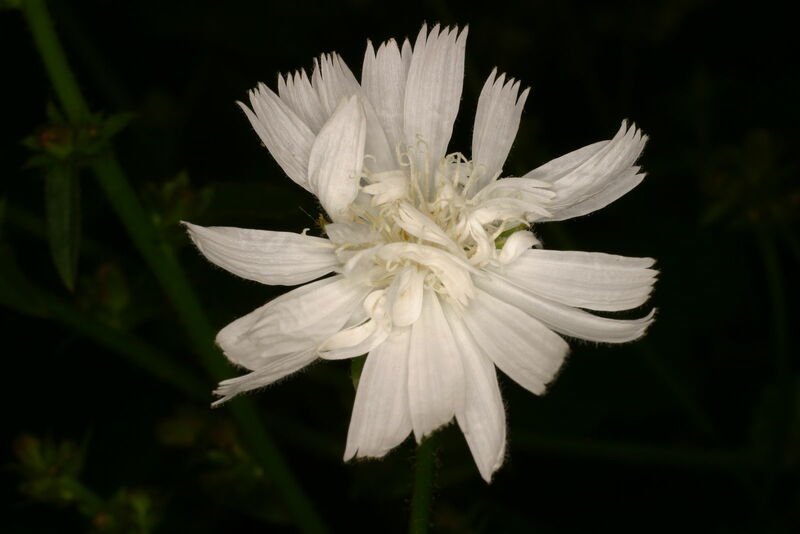 Cichorium intybus is used as a forage crop and its toxicity to internal parasites has led to research into using it to control worms in livestock. Chicory is cultivated as an ornamental, for example in wild flower borders. Chicory should be grown in a sunny and open site but will tolerate some shade. Although it benefits from rich and moisture retentive soils, it will also grow on poorer soils. The crop will require watering during dry weather in order to become established. Witloof chicory grown for forcing is sown from late spring to early summer. In the autumn the roots are lifted and stored in a box of moist compost and kept cool until they are needed for forcing. During the winter months (from December through to March) these roots can be potted into a deep container of moist compost and a continuous crop of chicons can be produced by repeating this every three to four weeks. Once the roots are potted, they are placed in a warm dark place, and the chicons should be ready for harvesting after about four or five weeks, once they are about 15-20cm long. Chicons are harvested by cutting them away from the roots at about 1cm from the top of the root. 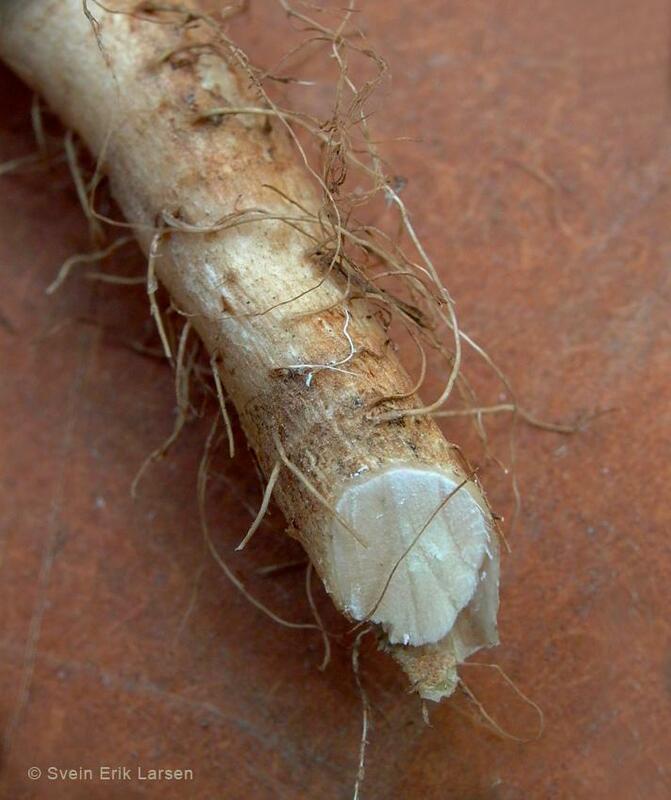 Leaving the root crown intact in this way means that it can be forced to produce a second crop. Other cultivars of chicory with less bitter leaves (such as members of the raddichio group) can be sown from spring and throughout the summer to produce salad leaves. It is important not to sow them too early as this can result in plants running to seed. Chicory is easily propagated from seed or root cuttings. Cichorium intybus can be seen growing in the Queen's Garden behind Kew Palace. 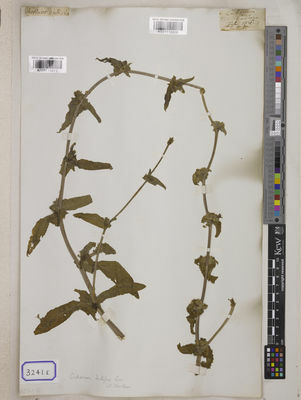 Pressed and dried specimens of Cichorium intybus are held in Kew's Herbarium, where they are available to researchers by appointment. Roots and seeds are also held in Kew's Economic Botany Collection in the Sir Joseph Banks Building, where they are available to researchers by appointment. Dry, sunny sites. Often found at field margins and dry roadsides. Common and widespread; not of conservation concern. The milky sap may irritate skin or aggravate skin allergies. Might be encountered but has so far never been collected in our area. Cultivated as a garden ornamental, or as a medicinal herb or salad plant, an extract of the root is used as a substitute for, or an additive to, coffee. It is cultivated elsewhere to provide root extract, used as a coffee additive. Cichorium intybus f. album Farw. Cichorium intybus subsp. balearica (Porta) Gand. Cichorium intybus var. glabratum (C.Presl) Gren. & Godr. Cichorium intybus f. rubicunda Farw. Cichorium intybus subsp. sativum (Bisch.) Janch. Cichorium intybus f. sativum Bisch. 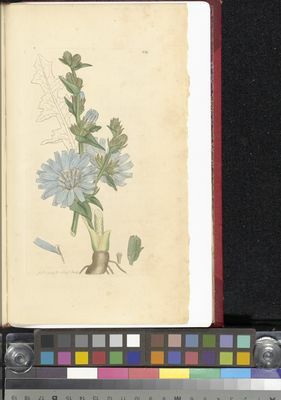 Cichorium intybus f. sylvestre Bisch. Missouri Botanical Garden (2013). Tropicos, Name search. The Royal Horticultural Society (2013). RHS Grow Your Own. USDA, NRCS. (2013). The PLANTS Database, National Plant Data Team, Greensboro, NC 27401-4901 USA. Mahr, S. (2012). The Wisconsin Master Gardener Program species page. Vaughan, J. G. & Geissler, C. A. (2009). The New Oxford Book of Food Plants. Oxford University Press, Oxford. Mabberley, D. J. (2008). Mabberley’s Plant-book: a Portable Dictionary of Plants, their Classification and Uses. 3rd edition. Cambridge University Press, Cambridge. Hamilton, N. (2007). Grow Organic: Fruit and Vegetables Fresh From Your Garden. New Holland Publishers (UK) Ltd., London. Brickell, C. (Ed.) (2003). The Royal Horticultural Society A–Z Encyclopedia of Garden Plants. Dorling Kindersley Ltd., London. Kiers, A. M. (2000). Endive, Chicory, and their Wild Relatives: a Systematic and Phylogenetic Study of Cichorium (Asteraceae). National Herbarium Nederland, Universiteit Leiden branch. Adanson, M. (1763). Familles des Plantes.